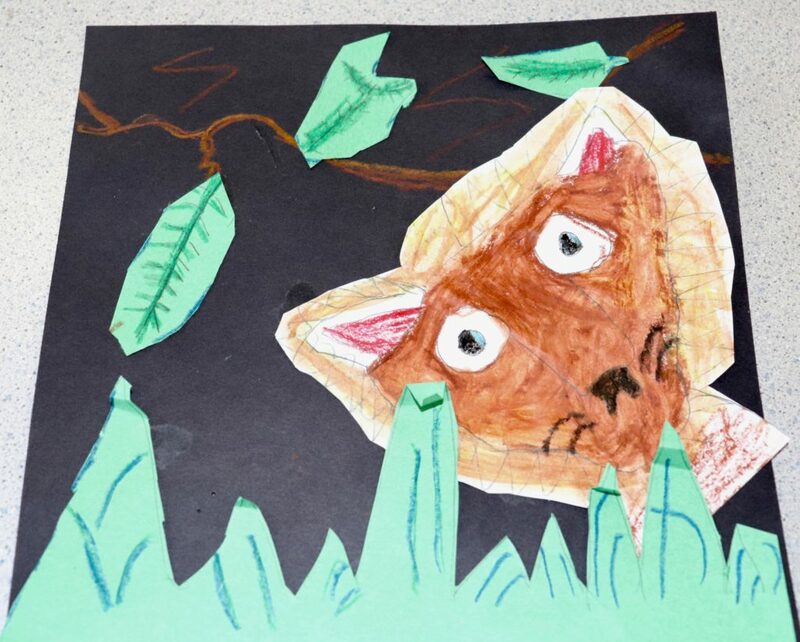 When a classroom full of fifth graders learned they would be studying the French artist Henri Rousseau, none of them had ever heard of him before. 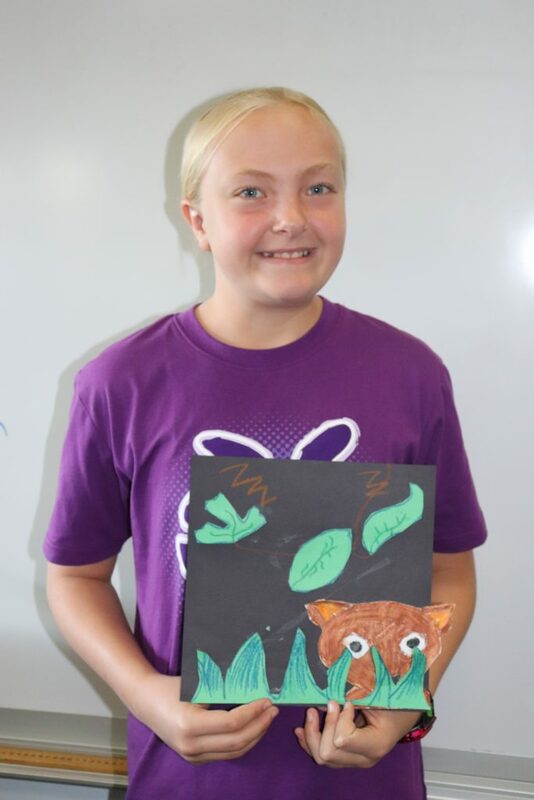 As the first half of the Meet the Masters lesson was presented by two parent volunteers, students learned that the post-impressionist artist Rousseau, who lived from 1844-1910, today is best known for his vivid jungle scenes. Tucked beneath layers of varying-length wild grasses and shielded by long, dangling leaves of all shapes and sizes, Rousseau carefully positioned each of his wide-eyed animals, who were seemingly ready to pounce right off his canvases. 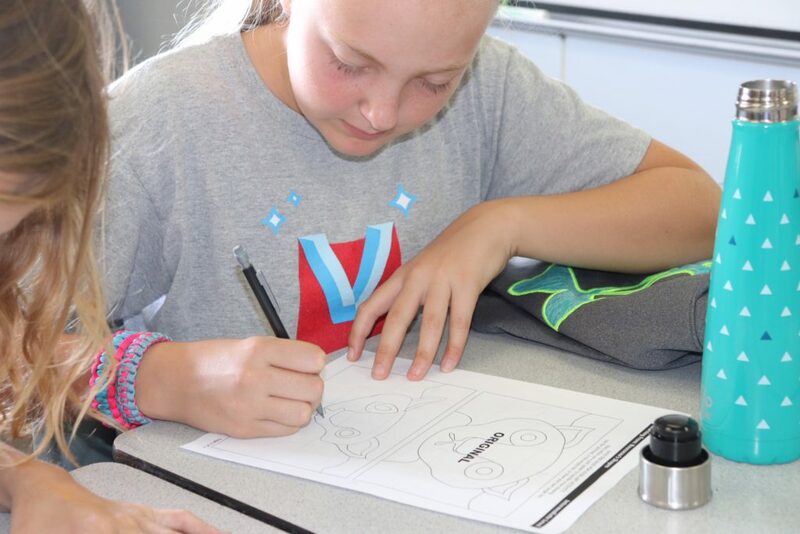 Most often, when students set out to create a picture, whether it be a simple drawing or a more complex painting, they have a tendency to start in the center of the page or canvas, working their way outward. 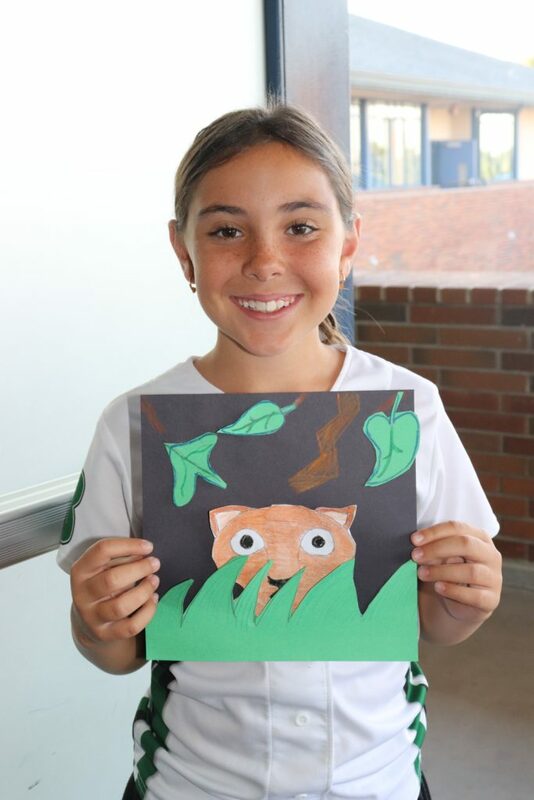 With fascination, students learned how Henri Rousseau always created his artwork from top to bottom, using one color at a time before starting back at the top all over again. How often have you looked at a child’s artwork that features grass and trees, and observed that the grass is a solid rectangular area of only one shade of green that monopolizes the entire bottom portion while the tree, in the same shade of green, resembles a big, puffy cloud as opposed to a collection of individual leaves? 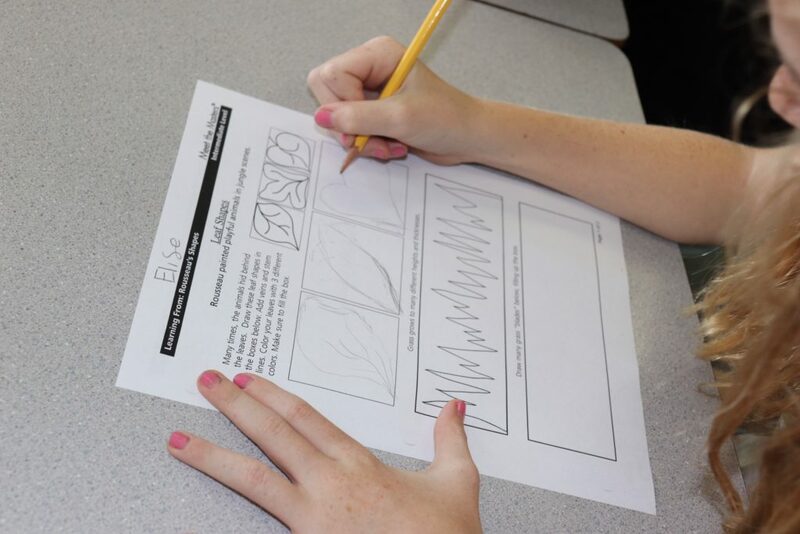 As the first lesson on Rousseau drew to a close, students utilized their practice sheets, where they focused on drawing basic leaves that varied in shape, just like one would find in Mother Nature. Additionally, students learned how to use zigzag lines as a means of creating tall, swaying grasses. 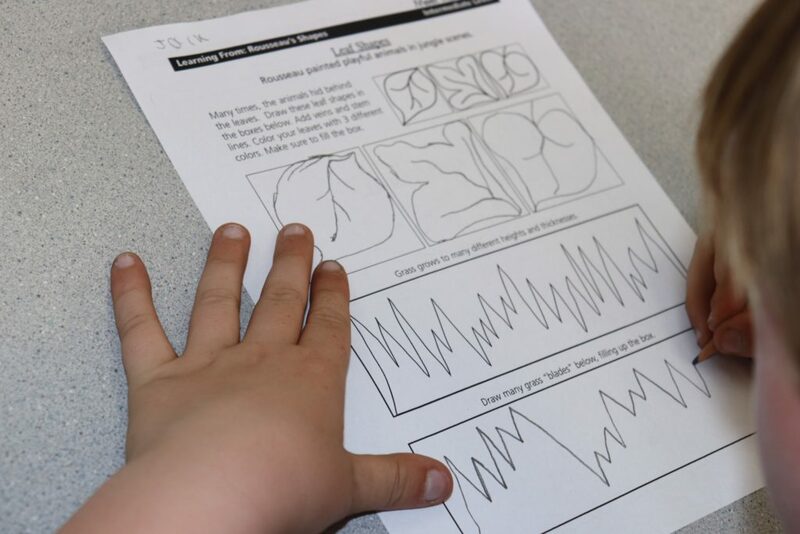 The first Rousseau lesson concluded with students using a grid to create the head and shoulders of a jungle lion. 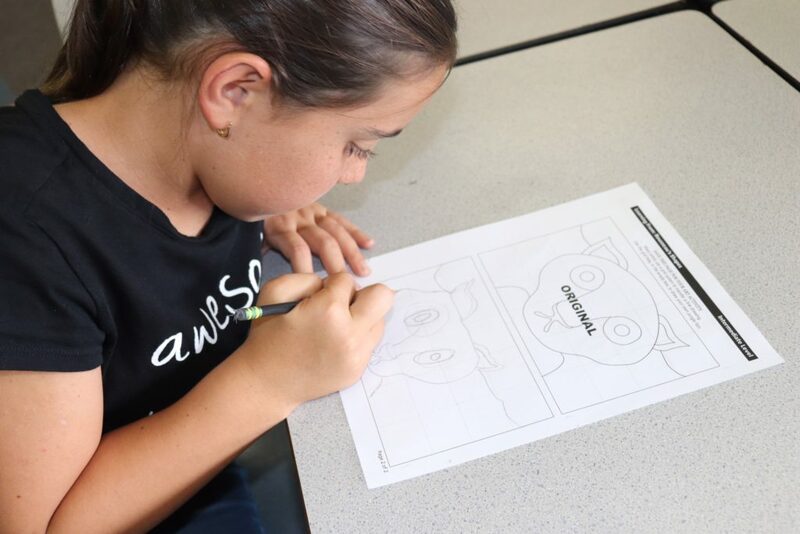 The grid allowed for a sense of symmetry, allowing students the opportunity to challenge themselves without the expectation that they would inherently know how to draw a lion. 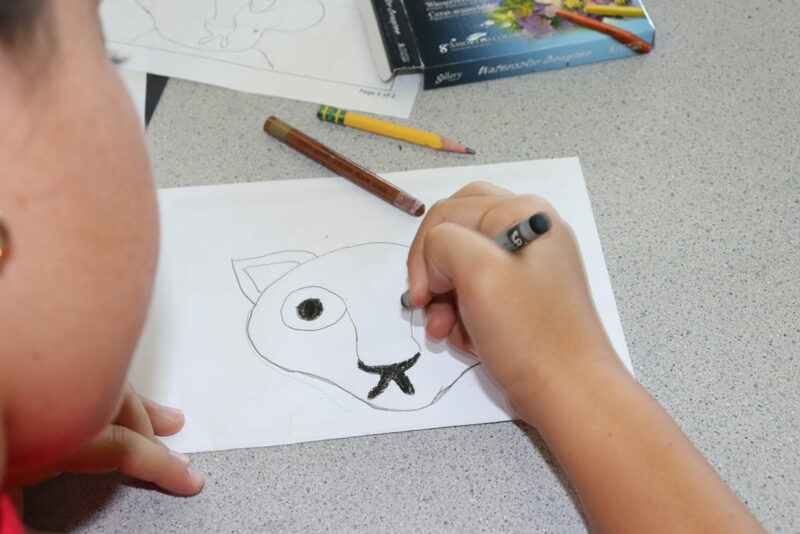 Those students who weren’t confident in their drawing skills breathed loud sighs of relief to learn that they would have guidance as they learned how to draw lions of their own. As the second part of the lesson began, students were asked to review what they learned about Rousseau. One of the most interesting facts that they readily recalled was that Henri Rousseau himself had never actually visited a jungle because he had never even stepped foot outside of his native France! They also recalled that, sadly, much of his artwork was not recognized as being especially noteworthy during his lifetime. For the second part of the lesson, students created their own jungle scenes. Before learning about Rousseau, if students were given different shades of construction paper, they probably would have first started with the main focal point of the artwork, the lion. 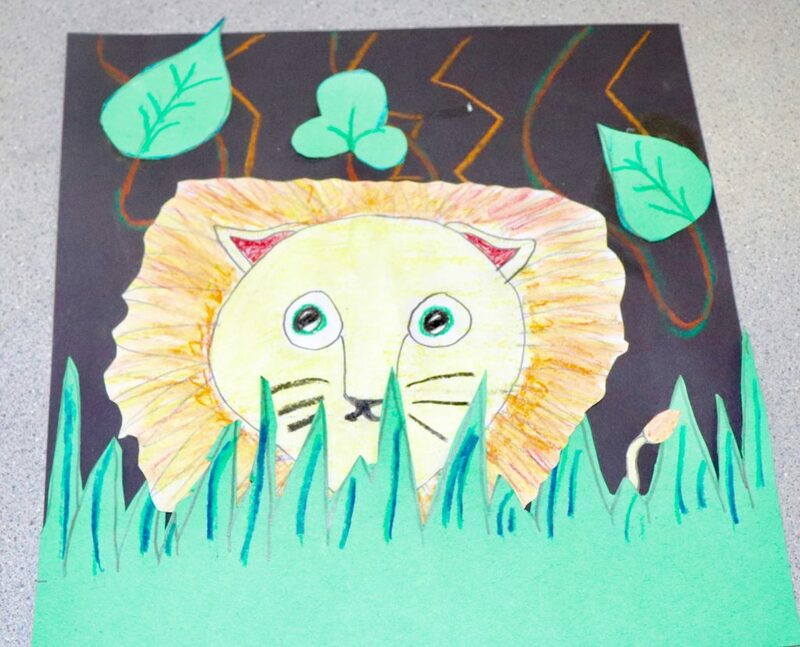 Honoring Rousseau’s style though, students instead first added jungle grass and leaves, where lines of texture had been carefully added with blue art crayons, before carefully placing the lion’s head and shoulders within the grass. 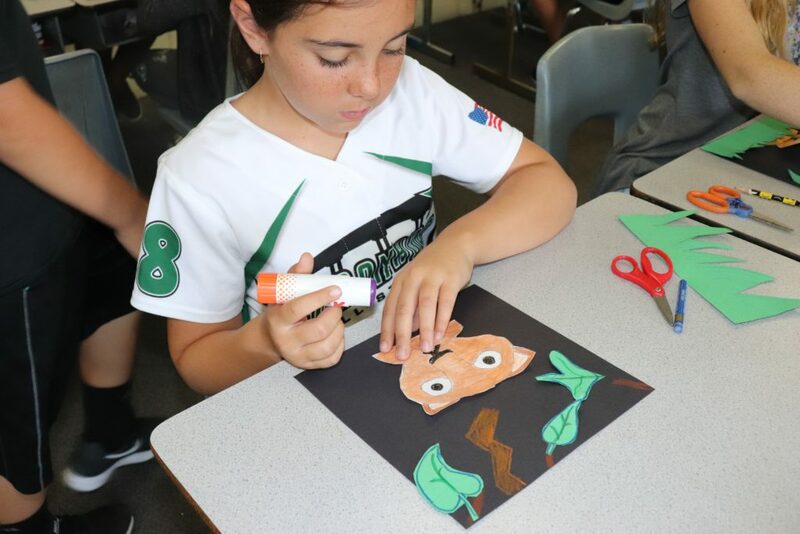 As the jungle grass was carefully glued to the black piece of construction paper, which served as the backdrop, the grass wasn’t glued flat to the paper like students would have normally done. Instead, the top portion of the grass was left unattached so, like in Rousseau’s paintings, it looked like it was swaying in the soft, jungle breezes. 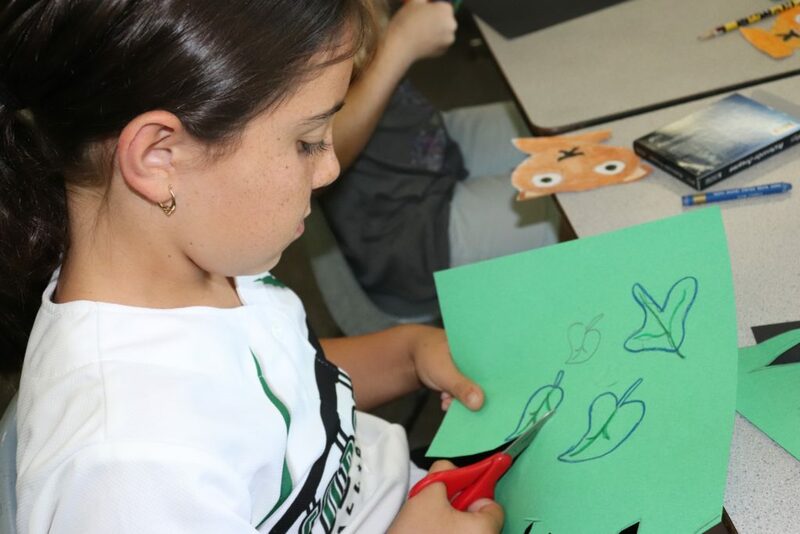 As they glued their leaves to the lightning bolt branches they had drawn on the black construction paper, students once again didn’t glue the leaves flat to the page, carefully using only dots of glue so they could bend the leaves onto the page. The leaves and grass looked three-dimensional. The lion was added last, but before gluing the grass on to her page, this student first played with the placement of the lion. Students had the choice to position their individual lions where they saw fit, but, like Rousseau, their lions were added last. Admiring their work, students observed how each lion looked like it was sneaking up on its prey. As students reflected on the significance of Rousseau’s work, one of the most important lessons they learned from him (other than how to pronounce Henri the way that French people say it,) was that it’s not always necessary to have actually seen something up close and personal in order to be able to create it for oneself. They also appreciated how Rousseau persisted in his artistic endeavors despite the fact that his work wasn’t celebrated by everyone during his time period. Even though critics at the time compared his work to that of a child, it turns out that simple artwork may, in fact, prove to become the most revered.